Flourishing hot tub and swim spa manufacturing powerhouse Wellis will be aiming to promote its latest design technology and increase its impressive expansion in the European market during Piscina & Wellness Barcelona 2017. Wellis has been among the continent’s major success stories, especially in the UK, and has ramped up its hot tub and swim spa manufacturing provision this year to meet growing demand from dealers and consumers ahead of showcasing its ‘Made in Europe’ credentials as an exhibitor at the Gran Via venue for Piscina & Wellness Barcelona, running from Tuesday, October 17, to Friday, October 20. After the Barcelona appearance Wellis will then be gearing up for Aquanale in Cologne, from November 7 to 10; before making a consecutive SPATEX appearance at the 22nd edition of the wet leisure showcase, from Tuesday, January 30, to Thursday, February 1, with an enhanced stand presence to follow on from its successful outing this year. This trade exposure is being backed up with consumer advertising campaigns in WhatSpa? and WhatSwimSpa? magazines as part of the manufacturer’s commitment to its booming British showroom network, which has been boosted in recent years with the inclusion of a host of pedigree dealers wanting to promote the European brand’s wide range of options in their showrooms. The growing British network currently has a host of WhatSpa? Approved dealers including: Chesterfield-based Miami Spas, Branton-based Wellis Hot Tubs Doncaster, Wellis Hot Tubs Derby, Uxbridge-based Aqua Hot Tubs, East Sussex-based Homewood Leisure, Wallasey-based The Hot Tub Place, Gainsborough-based AA Hot Tubs, Hereford-based Three Counties Pools & Spas, Shepton Mallet-based Allpools and Spas, Trowbridge-based Premium Tubs, Worthing-based Signature Spas,who also supply the MyLine and Superior Spas models; and Aberystwyth-based Welsh Hot Tubs who provide the Superior Spas options. To gain even greater dealer network expansion and market share the manufacturer has ramped up its production capabilities and has introduced a host of new hot tub and swim spa designs this year including the additional capability for the Rio Grande swim spa, pictured, that has the option now of incorporating the cutting-edge W-Power Turbine system in the Rio Grande Turbine; along with its Amazonas Turbine and Danube Turbine swim spa counterparts. In contrast to standard swim spa pumps the W-Power Turbine has 75 per cent less power consumption, while delivering twice the amount of water. It is being proclaimed in current sales and marketing campaigns for its capability to provide incredible performance combined with superior energy-efficiency. Ahead of the three high-profile exhibition appearances in Barcelona, Cologne and Coventry, Wellis has also been promoting its WPS cabinet frame that boasts ‘immortality’ for the hot tub frame; and the Scandinavian Insulation that has a much higher insulation rating with triple layer Polyfoam panels and additional under spa rim and floor pan insulation; which is being targeted at those owners who enjoy their hot tubs during the winter months while outdoor temperatures drop below sub-zero temperatures. Wellis, which has also recently launched a Holiday Let Spa, has gained a surge in popularity in the UK thanks to its pedigree European product promotion and commitment to exhibit at leading wet leisure exhibitions to showcase the innovative design technology, matched by precision engineering at its new state-of-the-art factory in Hungary; which also produces the Superior Spas and MyLine ranges for British dealers. 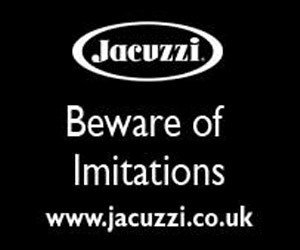 Leading dealerships have been enticed by the manufacturer’s advanced designs that were promoted in the final months of last year at Piscine Global in Lyon, and the Hot Tub Living Expo in Birmingham, before the 21st anniversary edition of SPATEX this year that was attended by Superior Spas chief and Wellis distributor Rob Carlin. They have been helping to promote the cutting-edge design in the latest StarLine range that includes the Explorer, Discovery and Voyager options, which are being highlighted to prospective owners in an advertising campaign for consumers in the latest edition of WhatSpa? magazine. These innovative models incorporate the new development by Wellis of the inclusion of an advanced diverter and air inlet regulator that ensures smoother and more precise massage settings; as well as the StarSide new corner cabinet accent panels with RGB lighting. Within the design a renewed filter house design provides users with the capability to view their favourite movies or online content on their tablets. For a second successive year Wellis has gained a further boost for its marketing initiatives after achieving 2017 WhatSpa? 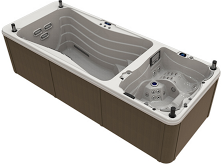 Best Buy Award-winning status with accolades for a trio of its six-seater hot tubs that include the new entry of the Superior Spas Dream in the below £4,999 price category; the MyLine Spas Venus, in the £5,000 to £7,4999 price category; and the Wellis Discovery Deluxe, in the £10,000 to £14,999 price category. Coming in at 218 x 218 x 97cm, the Discovery Deluxe from the HighLine range incorporates a lounge seat and 61 jets and has been praised for being ‘beautifully designed’ in the WhatSpa? Verdict, which also highlights the manufacturer’s new corner cabinet accent panels. The verdict declares that it is ‘certainly one to add to your wet test list if you are seeking a quality lounger spa that combines designer looks with great massage’. On the swim spa front, Wellis has been making a splash with a number of fledgling models that have created a wave of launch success, including the WhatSwimSpa? Best Buy Award-winning Wellis Danube Power that is 4m long and has three powerful River swim jets. One of the important features currently being promoted by the manufacturer and its dealer network is the fact that the depth is 1.5m and the width is 2.3m. Not resting on its laurels, Wellis has produced the Rio Grande Turbine that has been launched as a twin-chamber dual temp swim spa model for dealers to promote in their showrooms and has made an immediate impact by being bestowed with a WhatSwimSpa? Best Buy Award accolade in the 2017 edition of the consumer magazine. Coming in at 5.87 x 2.30 x 1.5m, it has the same swim chamber as the Danube plus the four-person hot tub chamber and is available in a Power version with River swim jets, as well as the newly-launched option of the W-Power Turbine System powered version; which is being advocated as the preferred choice if space and budget permits. The WhatSwimSpa? Verdict in the over £25,000 price category states that it has ‘an amazing amount of kit for the money’. Further details of Wellis’s complete range of hot tubs and swim spas can be obtained from the manufacturer’s Stand C108 during Piscina & Wellness Barcelona 2017; and on Stand C068-D069 during the Aquanale exhibition.